Kansas Sense, written by XBLUE founder, Larry Steinmetz, brings familiar but tricky business situations into perspective with a “simple wisdom” approach. It presents lessons learned the hard way… in the real world… with real people… in a way we can all understand and appreciate. 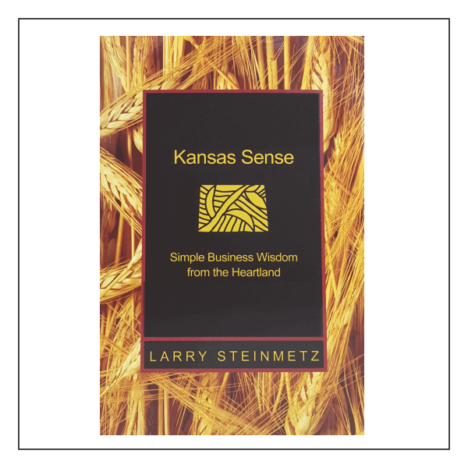 Author, Larry Steinmetz, is a 3rd generation Kansan, whose business career has taken him around the world from Asia to Europe to South America. Since graduating college Larry has lived and worked throughout the US and now his career brings him back full circle to his home state of Kansas. Larry brings his distinctive and pragmatic perspective to life in the pages of Kansas Sense in a personal and often humorous manner. Larry is a successful and widely-respected business executive, known for his level-headed, common sense approach to business and life. He has built and led numerous high-achieving teams in the areas of sales, marketing, product development, customer service and business development. Over the course of his career, he has led organizations to achieve record revenue, negotiated domestic and international supplier agreements and developed global strategic partnerships with major corporations. Inspire yourself or your team with a book study on Kansas Sense.